IBM® Storage Insights provides an unparalleled level of visibility across your storage environment to help you manage complex storage infrastructures and make cost-saving decisions. It combines proven IBM data management leadership with proprietary analytics from IBM Research. As a cloud-based service, it enables you to deploy quickly and save storage administration time while optimizing your storage. It also helps automate aspects of the support process to enable faster resolution of issues. Two editions enable you to select the capabilities that serve your needs best. Take the guesswork out of capacity planning with increased visibility into data growth rates and available capacity. Delay future purchases by identifying and reclaiming provisioned but unused storage. Easily track down the source of performance issues and preempt future service disruptions. Reduce costs by up to 50 percent by moving data to the most cost-effective storage tier using analytics-driven insights. Deliver an objective capital spending case to management with easy, detailed reports on storage consumption and predicted growth. 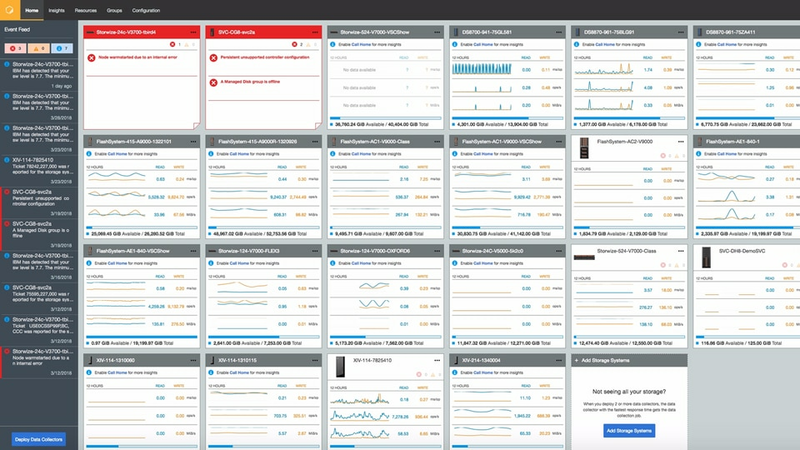 Resolve issues faster through one dashboard for monitoring your storage systems, and a robust and simplified IBM support experience. Monitor the basic health, capacity and performance of storage resources and engage with IBM Support. Available at no charge to IBM block storage users. All Storage Insights no-charge functions, plus more detailed information, longer history, and additional capabilities by monthly subscription.